Since the rash of books about males with eating disorders published in the 1990s and early 2000s, notably by those by Arnold Andersen and Harrison Pope and their colleagues, few others offering new and updated information on these issues have appeared. After a number of manuscripts on these subjects were coincidentally submitted at about the same time to Eating Disorders: The Journal of Treatment and Prevention, Leigh Cohn, the Editor-in-Chief (and in the interests of full disclosure, publisher of Eating Disorders Review), assembled a special issue on that topic in 2012. Here, he and Ray Lemberg, an editorial board member of Eating Disorders: The Journal of Treatment and Prevention, have compiled a welcome volume of 13 of those papers, together with four additional chapters specially written for this book. This rounds out a collection of contemporary perspectives on eating disorders in males by a first-rate group of experts. The international array of authors, from Australia, Belgium, Canada, England, Italy, Singapore, Spain and Sweden, as well as the US, attests to the fact that clinicians and researchers worldwide (at least in the developed world), are concerned with problems facing men with eating disorders. Several of the authors represented in this book have grappled with these problems and populations for decades, whereas others are relatively new to the field, promising that future generations of professionals will continue to serve and study these patients. As befits such a collection, the introductory kick-off chapter–perhaps better termed a benediction–is provided by Arnold Andersen, arguably the grandfather of systematic research involving males with eating disorders (and a former editorial board member of Eating Disorders Review). His “Brief History” of the field includes his own experiences with generations of eating disorders researchers, many of whom were pioneers in these fields, and encompasses several of his own significant contributions, e.g., formulations concerning overvalued beliefs. In the first two sections, several reviews give a concise overview of past literature, issues concerning assessment, diagnosis and under-diagnosis, and media objectification issues related to males with respect to eating disorders. A fascinating report of two cases of transgendered males with eating disorders raises slews of questions about biopsychological developmental issues. The several papers that address assessment issues and normative values for men on standard examinations, including the Eating Disorders Examination, Eating Disorders Inventory, and numerous other clinician and self-rated scales, will be of particular interest and value to researchers. A section on assorted psychopathological topics covers similarities and differences between eating disorders and gambling disorders in men, as well as psychological and medical morbidities seen in populations of adolescent males with eating disorders. This section includes an interesting descriptive study of body-checking and avoidance in males with eating disorders. For me, the most-engaging section was on treatment. Theodore Weltzin and colleagues describe their treatment experiences and outcomes with 111 male patients who remained in treatment for more than one week and who were treated in their facility over a seven-year period. These authors address general treatment principles as well as considerations of frequent comorbidities, such as substance abuse, mood and anxiety disorders, and excessive exercise. Douglas Bunnell and Margo Maine discuss issues of doing psychotherapy with male eating disorder patients, including considerations regarding sexual orientation, feminist relational perspectives, countertransference, and special considerations for female and for male therapists. Rounding off the volume is a brief section on recovery and prevention, two chapters dealing with outcomes, quality of life after recovery, and steps to enhance non-pathological fitness and wellness in males. 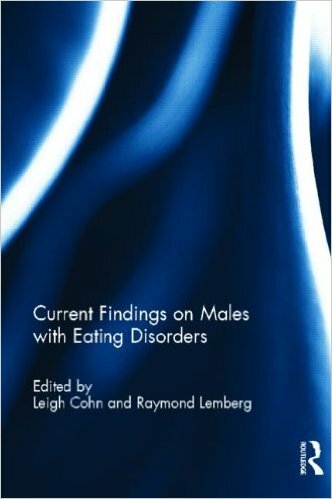 Overall, this volume provides a nice collection for those wishing to immerse themselves in current knowledge about males with eating disorders. However, as with other recent Routledge collections, the price for the book seems rather steep for such a thin (no pun intended) book.